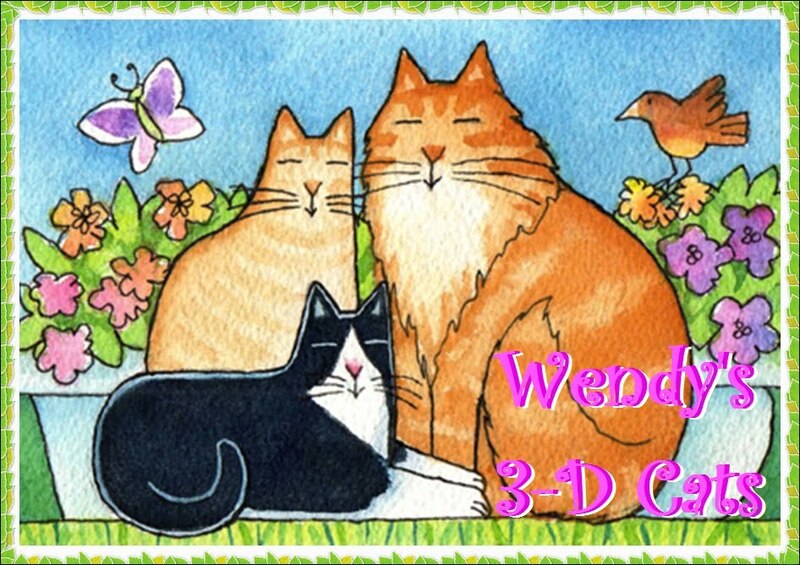 Wendy's 3-D Cats: 3-D CATS IN THEIR SUNDAY STRAW HATS! The 3-Ds are out and about again this Sunday, and sporting hats of straw to shade their little heads. Here's Dylan in his white straw porkpie hat banded in emerald tones with an out-of-this-world bowtie that combines bright teal and an equally bright orange to really make a statement. And what would that statement be, Dylan? "It says dat I yam da MONARCH of fashun 'round dese pawts! Wot else?" Dante is decked out in his ivory-coloured straw hat banded in stripes of rust, green and yellow. 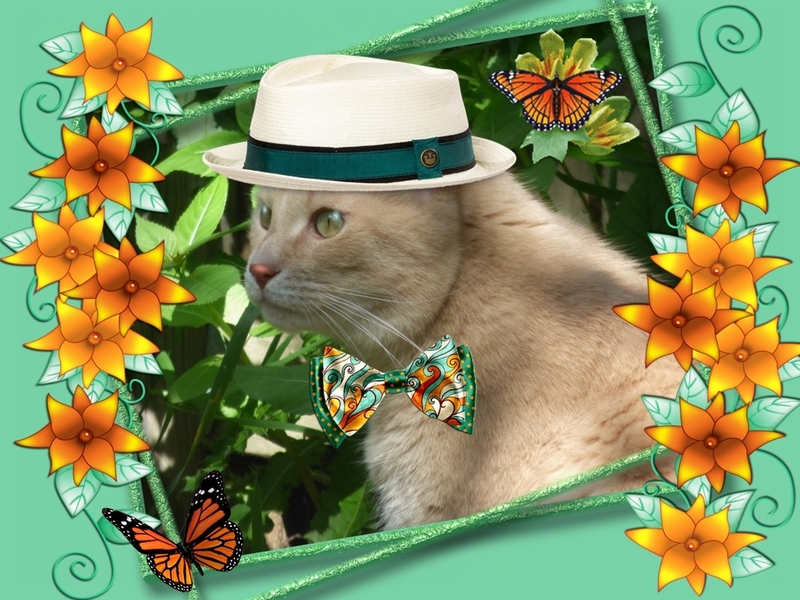 His bowtie is a real throwback, however, in ivory silk and covered in multi-coloured 'peace' signs. 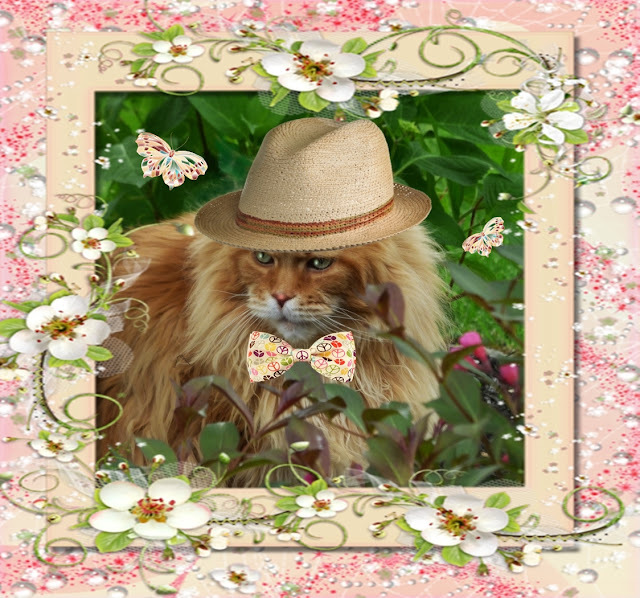 The butterflies in the bushes are like-minded and willing to accept this bowtie as one of their own. "We believe in peace for all races, creeds and colours", they say, "includin' bowties!" 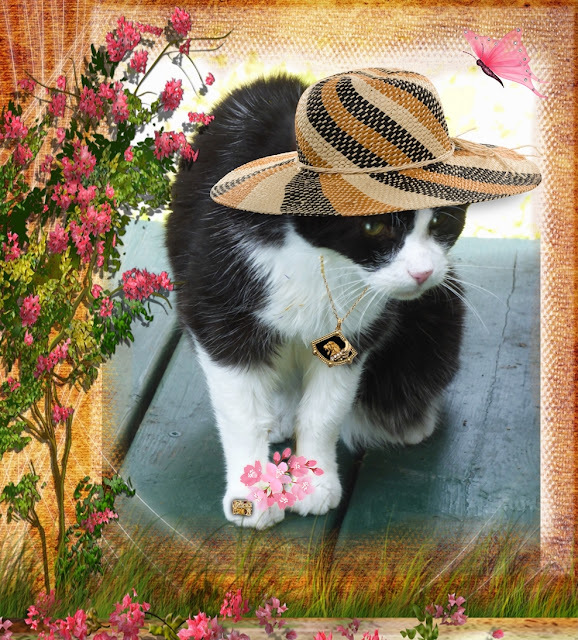 Domino is wearing a striking wide-brimmed straw hat in ivory, black and gold tones. 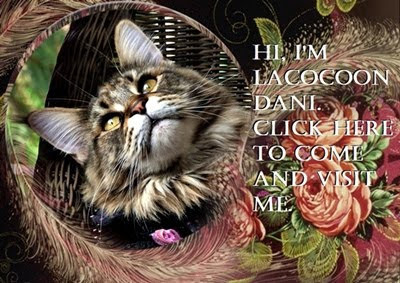 She has paired this with a gold and onyx lion necklace, and gold and cherry-coloured ring on her little paw. Domino is carrying some of the blossoms that have fallen off the tree, and has put some others in a pot of water to keep them fresh. "Jus' like me, dey're in full bloom!" says she. "An' ta make sure we stay dis way, yoo gotta keep us moisturized."